When I was growing up I mowed lawns and raked leaves for pocket money, as most Midwestern boys do. I often worked for Mrs. Werkley, a dainty sexagenarian who tended toward the eccentric. When confronted with the seemingly ordinary — a big-eyed bug, a volunteer plant, or even a weed she didn’t recognize — she would clap her hands with delight and exclaim that it was, “Most curious and interesting!” Folks considered her a bit of an odd bird. They had no idea. In her parlor Mrs. Werkley kept a plaster maquette of Australopithecus Africanus (wearing a whimsical yet decorous, embroidered fig-leaf.) On her mantle, between framed photos of the late Mr. Werkley and Dr. Loren Eiseley, was the skull of a sabre-toothed cat… just the thing to capture the imagination of an eleven-year-old. Loren Eiseley, of course, was a respected naturalist, ecologist and author. The eccentric Mrs. Caroline Werkley had been Dr. Eiseley’s research assistant for some 20 years… which might have explained a lot to the folks in that small-town neighborhood. Mrs. Werkley introduced me the work of Loren Eiseley, Raymond Dart, Louis and Mary Leakey, and a great many of their contemporaries, including a little waif of an English girl (to quote Mrs. Werkley) …who with Dr. Leakey’s encouragement was doing some very interesting work with the great apes in Africa. Though, sadly, she never knew it, Mrs. Werkley set me off on a course that has kept me curious and engaged in both amateur and professional studies of anthropology, sociology, natural history and philosophy for 30 years, and gainfully employed in fields related to cultural anthropology (call it digital ethnography) for the last 20. I had the opportunity to meet that “waif of an English girl” — Dr. Jane Goodall — two years ago at an SCAA event. 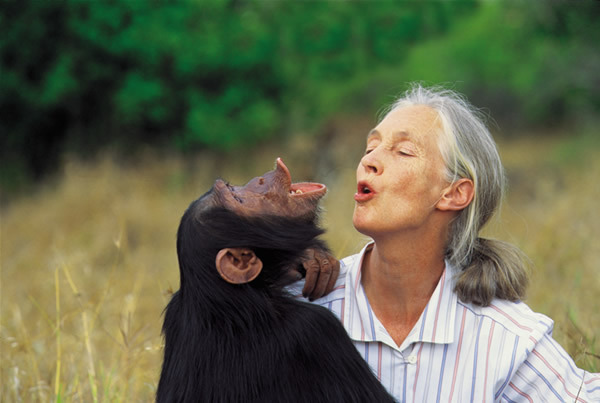 I was hugely impressed with her quiet charisma, her serenity and her continuing (and contagious) passion for her life’s work with the chimpanzees of Gombe National Park. And so I’m immeasurably thrilled to have the opportunity through Green Mountain Coffee Roasters to partner with Dr. Jane in the release of Green Mountain’s latest Special Reserve coffee: Gombe Reserve – in cooperation with the Jane Goodall Institute. Special Note: The Special Reserve offering is over, but the coffee lives on! The very same origin is now sold as Green Mountain’s Signature Tanzanian Gombe Reserve. The Gombe ecosystem is in peril. Social pressures and deforestation have concentrated chimp populations into an ever-smaller domain, and cut off the park from other forest habitats. By working in partnership with coffee growers on the park’s borderlands the Jane Goodall Institute hopes to enable a multi-village forest reserve. The partnership encourages coffee growers to commit to sustainable, shade-grown farming practices that improve the quality of their coffee, while preserving the natural overstory for chimpanzees. Price premiums for high-quality coffee will allow farmers to set aside corridors for chimp migration throughout the reserve and to other chimp populations in nearby Burundi. It is, in other words, a honest-to-goodness win for all. I’m grateful to play my small role in this remarkable partnership. I’m especially thankful for Green Mountain’s Rick Peyser and Lindsey Bolger who drove it to fruition (along with a great many other folks who’ve worked hard and long to see it through.) I’m grateful to Dr. Jane not only for her enthusiastic participation in this effort, but for all she’s done for the chimps of Gombe, and for her unparalleled efforts to increase our understanding of humankind. Finally, I owe a special debt of gratitude to Mrs. Werkley, who 30 years ago, nudged me down a most curious, and interesting path. Just ordered a bag! Just the kind of coffee we like to review. Thanks for this great announcement.